Equipment needed: Dumbbell, perch, lots of treats. 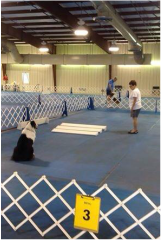 If you and your dog are getting a little bored with Novice training, why not start some Open training? This class will be geared toward the Novice trainer just learning CDX training techniques, as well as experienced trainers needing a venue to train young dogs at the CDX level. 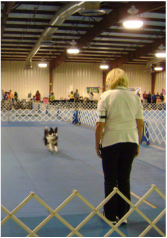 We will be working on jumping, drops, holding the dumbbell (and retrieves for dogs already proficient in holding the dumbbell), broad jumps, out-of-sight stays, and as always, polishing our heeling. Class meets on Thursdays. We will skip the 3rd Thursday of each month so members may attend the club's General Membership meeting. 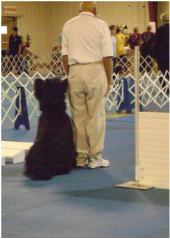 What we will be working on: This course will test and strengthen your dog's understanding of the skills needed for the AKC Open and Utility obedience ring. 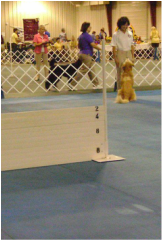 We will be working on heeling, retrieves, jumping, signals, moving stand, etc. 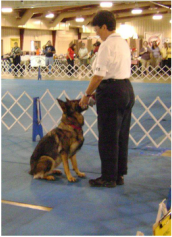 This class is intended for dogs and handlers who already know the exercises, but need to polish their skills for the ring. Prerequisite: Dog must be reliable off-lead around other dogs and distractions. They must also have basic retrieve skills (i.e. dumbbell). We will not be teaching the actual retrieve or dumbbell hold in this class. It is not required that your dog have a CDX title, but a CD is preferred. Equipment needed: Dumbbell, directed retrieve gloves, flexi lead, pull tab, (scent articles may be included, but we will not be covering how to teach articles) and lots of treats or a toy (no tennis balls please).